Alphabet creams—you know, BB creams, CC creams, and the like—changed the way we think about face makeup, amping up the humble tinted moisturizer with brightening antioxidants, light-reflecting particles, and SPF. Now brands are starting to apply that idea to your body. Don’t worry, the formulas in our slideshow aren’t anything like streaky body bronzers. Instead, these hydrating body moisturizers pack good-for-your-skin ingredients and a light tint to even out your skintone—not change it. Your pale legs just got excited for spring. Jergens’ new BB Body Skin Perfecting Cream ($12) comes in two lightly-tinted shades—one for fair skin, one for medium to dark—that go on sheer and turn your whole body radiant. (It won’t rub off on your clothes, we promise!) They work by hydrating skin with shea butter, blurring imperfections with light-reflecting silicones, and brightening skin with just a touch of self-tanner. Seriously, you won’t even know it’s there. Gwyneth Paltrow’s raved about Prtty Peaushun’s Skin Tight Body Lotion ($40) on more than one occasion, saying the formula makes her skin glow and brings out her muscle tone. How? The formula firms with caffeine, brightens with botanical extracts, and hydrates with avocado extract. It comes in four tinted shades, plus one non-tinted option. Like the previous formula, Miracle Skin Transformer’s Tinted Body Lotion ($35) comes in tinted formulas as well as a plain option. Each packs an impressive list of ingredients: caffeine to firm, blue-green algae to smooth skin, chamomile to calm irritation, SPF 20 to protect, hyaluronic acid to hydrate, and more. If you’re looking for something with a darker tint, try Perfekt’s Body Perfection Gel ($50). The sheer formula imparts more color onto skin than the former options, comes in three shades, and, like a BB cream for your face, has a cocktail of good-for-your-skin ingredients like hyaluronic acid, shea butter, and ceremides. Looking for something scented? 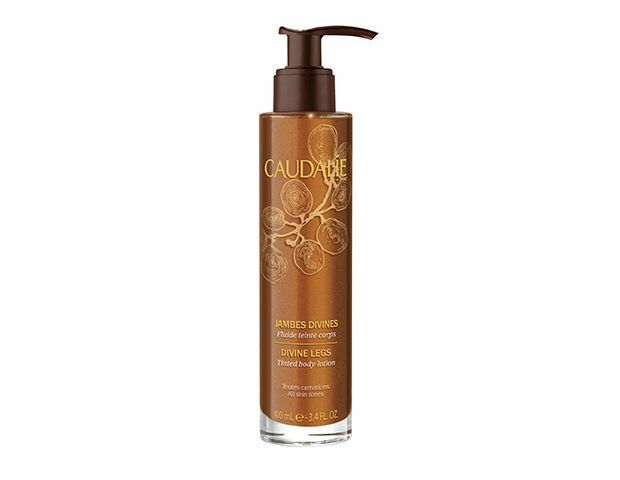 Caudalie’s Divine Legs Tinted Body Lotion ($40) has a fresh and bright scent (expect notes of grapefruit, rose, and white musk), plus a bronzy tint. It’s packed with grape seed oil for hydration, brightening chicory extract, and carob extract to help maintain your tan. 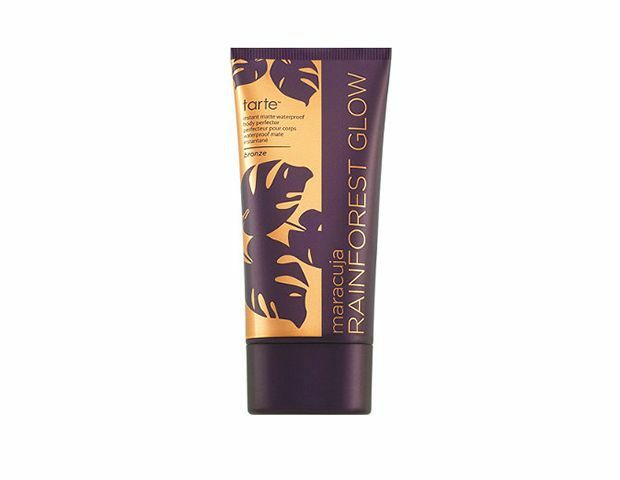 The formula that gives the most color on our list is Tarte’s Maracuja Rainforest Glow Instant Matte Waterproof Body Perfector ($40). In fact, it’s the most advanced body bronzer we’ve ever tried. Why? It’s totally matte, and while it comes out of the tube dark, it’s incredibly foolproof to apply. It melts into skin, giving a streak-free glow that won’t rub off on clothes (trust us, we tried). Plus, it has brightening antioxidants like vitamins A and E and essential fatty acids from their signature marcuja oil.